Rabbit, Rabbit, everyone! It’s the first of the month and I’m sure after trying my delicious tiramisù recipe you are ready for another delectable Italian dessert perhaps even more well-known: CANNOLI. Cannoli originated in Sicily and there are many versions of fillings and additions and decorations but the one I am going to give you here is the simplest and the most common. First you need to buy cannoli shells (tubes of fried pastry dough) already packaged. Many Italian specialty food stores carry them. From this point on, it’s a breeze. Make sure you serve them soon after they are made, as you do not want the pastry tubes to get soggy from the filling. Either that or keep them well chilled until served. Once your filling is done and put in a pastry bag, you are practically finished. Makes 20-30 cannoli depending on size & filling. Empty entire container of ricotta into a large mixing bowl. Make a deep “well” in the middle of the ricotta and drop two whole eggs into the well. Start by adding 3 packets of sugar and blend the ricotta, eggs and sugar with a rubber spatula. When the mixture is well blended (by hand) taste to see if you prefer the mixture to be sweeter. If so, add more sugar and blend again. Stir in about 1 cup of chocolate chips and blend well so the chips are dispersed evenly. When the mixture is ready, spoon as much as will fit into a pastry bag and twist tightly at the end. Make sure the opening of the pastry bag is wide enough to squeeze the chocolate chips through and begin filling the pastry tubes first half-way at one end and then fill the other end to complete the tube. Holding the cannolo in the middle, press one end gently into a small bowl of chocolate sprinkles. Then press the other end of the cannolo gently into the bowl of crushed pistachios. 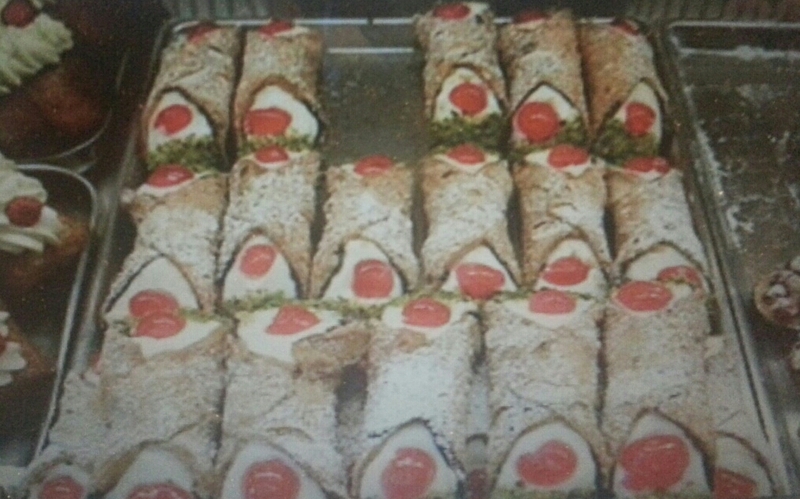 If you prefer, you may place a dried fruit cherry half into each end of the cannolo. Place cannoli on a platter in such a way that you may sift confectioners sugar over the tops of the cannoli. Place in refrigerator and don’t wait too long to serve so the pastry tube remains crisp. Buon appetito!! I do hope that you have enjoyed this week’s blogs of easy Italian dessert recipes. Please right a comment and let me know how they worked out for your special dinner or party. I will reply quickly! Have a pleasant weekend and join me next week as we return to the wonderful THASC artists and take a look at Autumn at its peak! Hope you are enjoying the foliage! Zia! Although I may be an adult now I still want the sweet canoli’s. Sounds fantastic and looks so good! So glad some of the Italian cooking I’ve made for you has lasted through your life. This is so easy that you and your roommates could whip some up. I am so grateful you took a minute to send me a comment. Love you. Thanks so much for leaving a comment. You can make these in very little time. Buon appetito! To try to make some. When l make them some day,l will let you try one. They don’t seem to hard to make. Well, enjoy the first day of fall!!!! Dana, they are so easy to make you can make a batch in avout 1/2 hour. Thanks for always commenting. Rabbit Rabbit. I will definitely try this. Just had a cannoli at the big e. They use mascarpone cheese, and we’re surprised when I asked. I only knew because of your blog. Reminded me how much I love them. These recipes are great, I loveIta to cook but I have a hard time coming up with ideas. I love all Italian food but the desserts especially. Thank you for the quick and simple recipes. I eat them often and the best is typical Palermitano…. Angelo P.
My curiosity is getting the best of me tonight. What is the meaning of ‘rabbit rabbit’? I love cannoli and have never entertained the idea of making them myself. You make it sound so easy so I am going to attempt to make some. Living on a Caribbean island with not one Italian bakery makes me sometimes long for sweet Little Rhody with its abundance of good Italian bakeries. So, Maria, mille grazie for your recipe. I will let you know how they turn out!